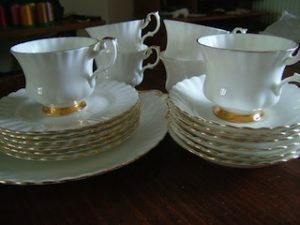 A Royal Albert fine bone China gold decorated part tea service, to include six teacups, six saucers, six side plates and a tea tray. 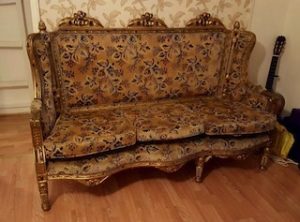 A three seater high back sofa on a gold painted heavily carved solid wood base, upholstered in floral patterned gold velour. 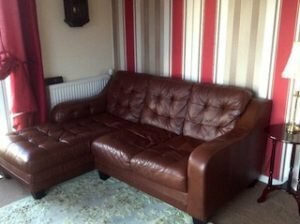 A four seater high back left hand corner sofa on black legs, upholstered in chocolate brown buttoned leather. A vintage high back gentleman’s armchair on solid wood legs, upholstered in brown authentic leather with brass studded detailing. 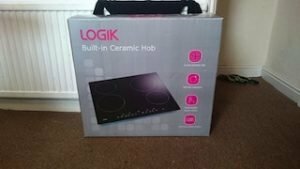 A brand new boxed Logik black built in ceramic hob. 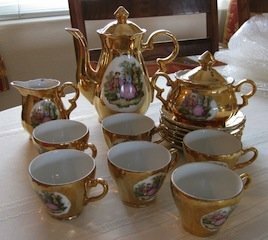 A vintage decorative porcelain metallic gold tea set, to include a large teapot, a milk jug etc. 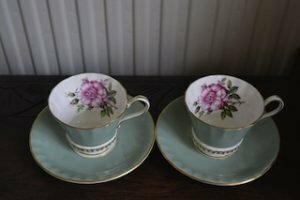 A pair of duck egg blue gold rimmed Aynsley fine bone China teacups and saucers, decorated to the inside with a large flower. 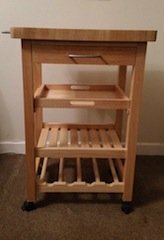 A small solid pine kitchen butcher trolley on castors, having a small drawer above a pull out tray, a shelf and a wine rack. 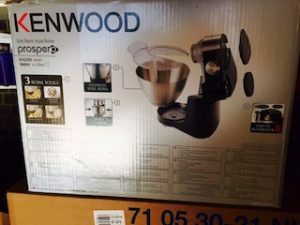 A brand new boxed Kenwood Prospero KM280 black and stainless steel kitchen machine. 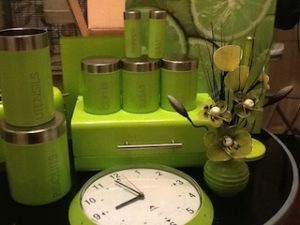 A large collection of lime green kitchen accessories, to include a bread bin, a circular wall clock, salt and pepper shakers, a wall canvas etc. 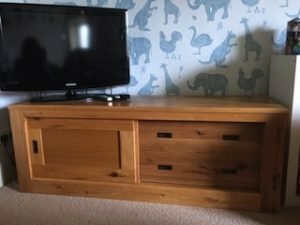 A large solid oak sideboard, having a sliding door cabinet aside two large drawers, together with a black Samsung flat screen television. 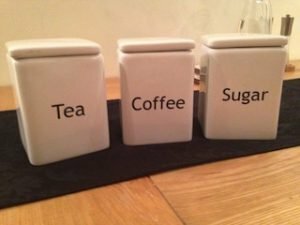 A set of white square ceramic tea, coffee and sugar canisters with black writing. 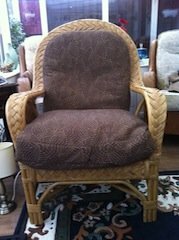 A vintage curved back wicker fireside armchair, upholstered in chocolate brown and gold leaf patterned fabric. 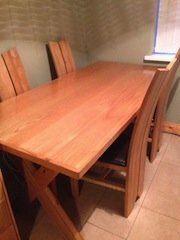 A large solid wood rectangular dining table, together with five matching high back dining chairs, upholstered to the seats in chocolate brown faux leather. A tall standing white high gloss triple wardrobe, having a large mirror to the centre and six drawers to the bottom. 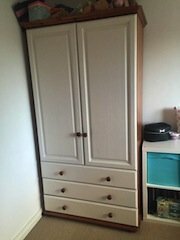 A tall standing white painted solid wood double wardrobe, having three large drawers to the bottom. 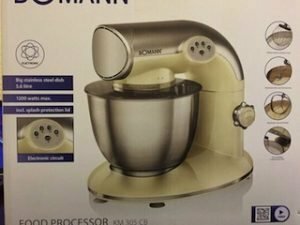 A brand new boxed Bomann Km 305 cream and stainless steel retro style kitchen machine. 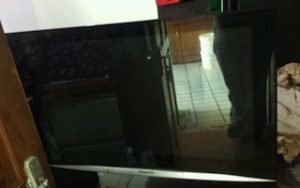 A black and silver 42 inch flat screen Panasonic Viera television. 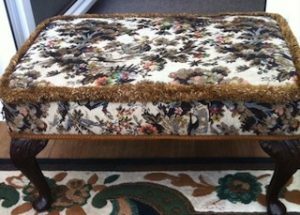 A vintage solid mahogany large footstool, upholstered in floral patterned fabric with a shaggy border. 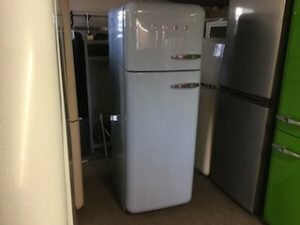 A tall standing pastel blue Smeg Fab 30 70/30 frost free fridge freezer.